Approximately between 4-10% of people with inflammatory bowel disease experience eye problems. Most of these are treatable and do not pose any significant threat as far as loss of vision is concerned. Still, if you notice any type of eye irritation or inflammation, it’s best to seek medical attention sooner rather than later. The problems may occur as a direct result of your IBD but in some cases they can be side effects as a result of medications taken to help control your condition, such as corticosteroids. And for some people eye problems are the first sign they have a problem with their immune system and that they may have IBD, where as others experience these complications after years of living with IBD. This post will look at Uveitis, Episcleritis, Scleritis and Keratophy. Ocular complications are categorised as primary, secondary, and coincidental. Primary complications are associated with IBD exacerbations and tend to resolve with systemic treatment of the intestinal inflammation. These include keratopathy, episcleritis, and scleritis. Secondary complications arise away from primary complications ie when your disease is controlled and symptoms persist or reoccur, and coincidental complications occur commonly in the general population and cannot be correlated to IBD alone. It’s important to pay attention to nagging symptoms such as unusually red eyes, floaters, blurry vision, pain, or unusually dry or teary eyes. Rather than ignore these symptoms, seek medical attention. A regular examination by an ophthalmologist is very important. Early detection of eye problems generally results in successful treatment and preservation of healthy vision. One of the most common eye complications in IBD is uveitis, defined as painful inflammation of the uvea – the middle layer of the eye wall. Individuals with uveitis may notice pain, blurred vision, sensitivity to light, and redness of the eye. These symptoms may come on gradually or quite suddenly. To make a diagnosis of uveitis, an ophthalmologist uses a “slit lamp” – a special microscope that allows the doctor to look at the inside of the eye. Uveitis generally improves when the IBD is brought under control, but does not always correlate with active bowel disease; it can occur both during inactive or active periods of intestinal inflammation and can precede the diagnosis of IBD. It is commonly associated with the skin findings of erythema nodosum and joint pain. Treatment initially entails steroids eye drops to help reduce inflammation, but in severe cases, systemic steroids or an immunosuppressant is necessary. If left untreated, uveitis may progress to glaucoma and possible vision loss. This condition is an inflammation of the outer coating of the white of the eye, called the episclera. When the tiny blood vessels of the episclera become inflamed, they dilate and the area becomes red. In addition, episcleritis also may produce pain and tenderness. Steroid eye drops and topical vasoconstrictors are commonly used to treat episcleritis, but the condition may resolve on its own as the patient’s inflammatory bowel disease starts to improve. However, if the episcleritis is more severe or does not resolve with systemic treatment of the IBD, topical NSAIDs are needed. If these are not effective, topical steroids like prednisone-acetate may also be considered. In certain refractory cases, oral nonsteroidal anti-inflammatory drugs (NSAIDs) can be used. However, these cases should be managed in conjunction with the patient’s gastroenterologist as NSAIDs can prompt an IBD flare and can worsen gastrointestinal problems. Episcleritis is commonly confused with conjunctivitis, which is a common condition and may occur coincidentally in a patient with IBD. Scleritis, a more rare complication of IBD, can result in severe visual morbidity. Scleritis, unlike episcleritis, is not always associated with active Crohn’s Disease and can occur in otherwise inactive IBD. 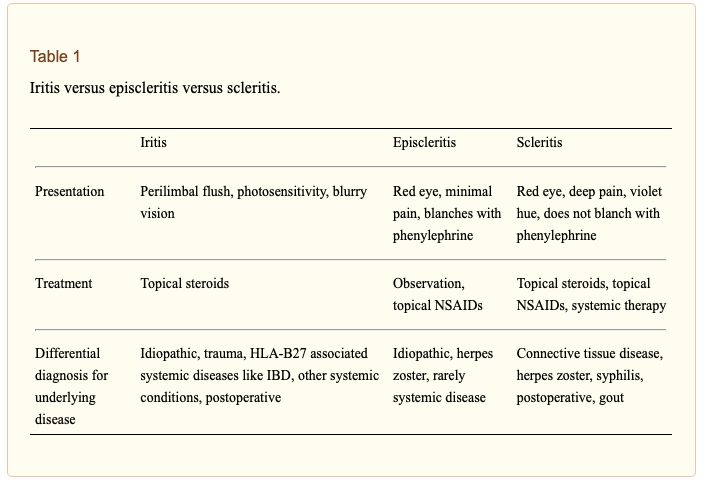 Scleritis must be treated with aggressive systemic management including systemic steroids and NSAIDs or immunosuppressants typically in conjunction with the gastroenterologist. Repeated episodes of scleritis can result in extensive thinning of the sclera which can result in perforation. So, aggressive control of the underlying bowel disease is important to reduce the recurrence. This eye disorder is an abnormality of the cornea that develops in some people with Crohn’s disease. An ophthalmologist will use a slit lamp to make the diagnosis by spotting white deposits at the edge of the cornea. Patients usually present with a known diagnosis of IBD but rarely the keratopathy may precede the diagnosis. Keratopathy does not cause any pain or lead to loss of vision, so usually it does not require treatment; but as there are no known reports of lesions that have been biopsied, the pathology and the underlying cause of these infiltrates are not known. Corneal involvement may also occur secondarily to scleritis. Systemic immunosuppressive treatment for the IBD is usually sufficient for this condition. Luckily, throughout my diagnosis with IBD, I have yet to have any eye issues. My EIMs tend localised to my skin or joints, but I have had yearly appointments with an optician to keep my vision in check. This is partly due to my already known need for glasses but also because of my employment; working with computers for most of the day. So far, nothing has been seen with my eyes from my IBD. But keeping a check on it, helps me keep peace of mind for this going forward. Next time…we explore when and how IBD can affect the skin. Thank you for this information! I never really get much topic about the eyes, and I’m glad I was able to come and read this article.